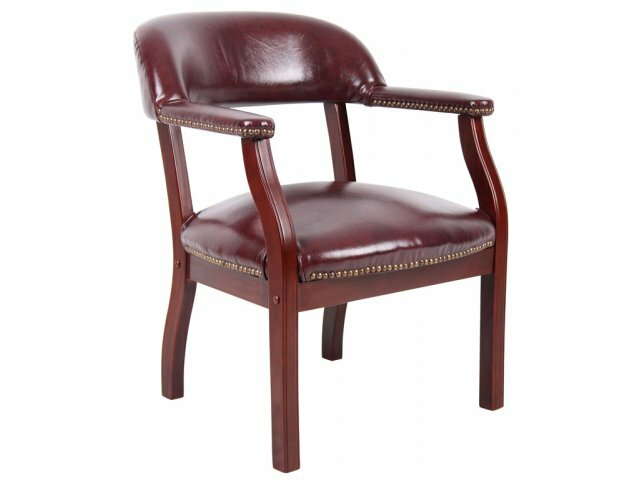 Take your office to a new level of elegance and style with this Captain's Arm Chair from Boss. 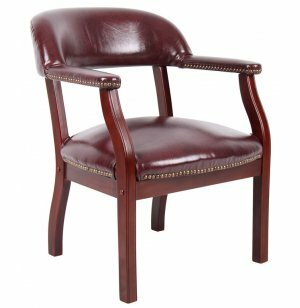 This classic captain's chair is perfect for reception areas, conference rooms or as guest seating in private offices. The hardwood frame finished in Mahogany lends a rich look, and is accented by hand-applied brass nails that won't fall out despite steady, everyday use. Extra comfort is provided by the spring suspension seat, generous seat size and padded arms. Whether for you, your employees or your clients, your office will enjoy these captain's chairs for years to come. Built to Last: The hardwood frame finished in Mahogany and upholstered in soft durable vinyl fabric is built to withstand years of constant use. Classic Design: With hand-applied brass nails, the timeless, captain design never goes out of style. Extra Comfortable: Spring suspension seat, padded arms and generous seat size provide added comfort. Versatile Use: These captain chairs can be used for various office functions, including waiting areas, meeting rooms and private offices. Back Size: 12.5"H x 24"W.
Arm Height: 22" from floor.